Checkout even quicker with The Parking Spot app! The latest update for The Parking Spot app was released to the App Store and Google Play last week. This update includes a number of new features that will allow you to check-in and out of The Parking Spot even easier! 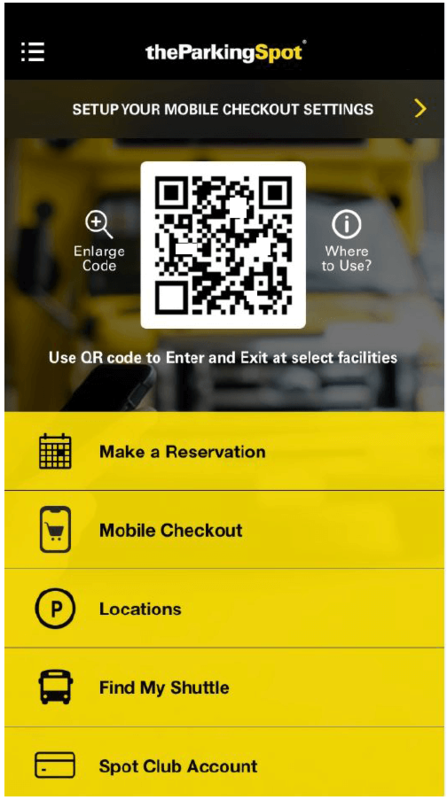 After you update your app, you will first notice that your virtual Spot Club QR code is now available on your app homepage, providing easy access to your QR code as you check-in and out. But that’s not all! This update also includes enhancements to our “Mobile Checkout” feature. Enjoying a “Mobile Checkout” by scanning your virtual Spot Club QR code at entry and exit has always been the easiest way in and out of The Parking Spot since we installed our new entry and exit system*, but these enhancements now make this feature even more convenient for our guests. Mobile Fast Exit: Enabling Mobile Fast Exit is the quickest way to get home after your trip. Turning this feature on will tell our system to instantly charge the credit card you have saved to your Spot Club account the second you scan your QR code at our exit gate. The gate will open, a receipt will be emailed to you, and you’ll be on your way—no other interaction at the checkout system will be required! Discounts and coupons: Just like you are able to tell us to instantly charge your credit card at exit through Mobile Fast Exit, you can also attach a coupon to your QR code before reaching the exit gate. That way, you won’t have to go searching for your coupon after you land. Scanning your virtual Spot Club QR code will automatically apply your coupon to your stay! If you add multiple coupons to your account, the system will choose the one that gives you the best deal. Link a paper ticket to your account: If for whatever reason you weren’t able to scan your QR code at entry, you can use the “Already parked? Link your paper ticket” link to connect a paper ticket to your account electronically. This way, you can still take advantage of Mobile Fast Exit and Discounts and coupons, making sure you zip right out of the lot after your trip. Download this latest update to The Parking Spot app and try these new enhancements out on your next trip! *Our new entry and exit system is available at select locations only. All locations are scheduled to have the new entry and exit system installed in the coming months.